Long Beach, California had been my home for 10 years. I videotaped what I saw around me: candy-colored sunsets, glittering lights of the oil refineries and ports becoming beacons at night, an “Emerald City ” straight out of The Wizard of Oz, and ubiquitous oil derricks that spotted the landscape and backyards of residents. The more I looked, the more oil derricks I saw. At least half of the derricks weren’t operating. They stood on the ground, monolithic and abandoned, and reminiscent of dinosaurs. Refineries billowed steam from stacks. The port life continued its own unique tempo 24-7. Until the rainy season came, I didn’t know there were mountains within view. The video really began in 2001 when I first saw a sunset from Keys View in Joshua Tree National Park. The sunset was spectacular, brilliant. Dense smog rolled out from the Los Angeles basin through the pass between St. Jacinto and San Bernardino Mountains, past Palm Springs and all the way to the Salton Sea. The smog was a key ingredient to the beauty we witnessed. I was struck by this conflict and wanted to explore the conflict between beauty and danger, and the balance of vulnerability and industriousness. Requiem for Black Gold is a visual poem of complex nostalgia for an industrial age fueled by petroleum, a call for hope for newly discovered energy sources, and for things not always being what they appear to be. The video invites the viewer to consider questions of beauty despite, and in consequence of industry, degradation of the environment and possibilities for its sustainability. Reading similar to a scrapbook album that memorializes and images ephemera, the video highlights geographical and tangential regions of the ports of Los Angeles and Long Beach, a major industrial and urban complex that serves as a nexus to economic exchange, production and sustenance in the western USA. 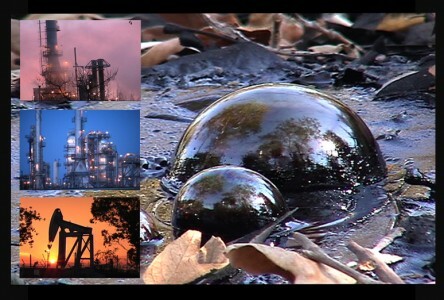 Beginning with images of the La Brea Tar Pits and oil derrick activity, the video moves from images of fuel extraction to refinement, production, consumption, and transport, to profuse smog that encases the region’s atmosphere. The air quality in the Los Angeles and Long Beach port region is referred to as “the black cloud of death.” With the adoption of the Green Port Policy in 2005 and recent ordinances and programs supporting the Clear Air Action Plan, measures are currently in place to reduce the amount of emissions in the port area. Change is a necessary action.